You made it. You are here. Near the end of a year and at the cusp of a brand new one. You know what that means, right? T’is the time for my annual “12 Questions”. Time passes. Stuff happens. What marks a year, is not the number of days that occur (same every year) but the experiences, the impact, and transformation that makes you the person you are today. Through this lens of reflection, take some time to reflect, honour, and own the impact of the year behind – and get ready for a fresh start. As always, you’ll see some repeat questions from year to year and some new ones and some tweaked with nuance changes. Since each year is distinct – I invite you to bring fresh eyes to this year’s reflection. This continues to be the most important yet, often overlooked, question. Great for completing a year – and also worthy to ask at the end of week, day, or project. Why is this so important? In our busier-than-ever lives and careers, noticing the good is a crucial skill for resilience, success, and wellbeing. Our brains are not wired to hold on to the good (evolution has taught us to be wary) so we need intention and attention to remember the good to balance our perspective. 2) What was your proudest moment? Pride is indeed a healthy emotion and in the speed of life and work we often bypass or minimize our accomplishments and are no sooner on to our next challenge. So, go back to ‘what went well’ and find the shiniest of moments that make you proud. It need not be big by anyone else’s standards but is worthy to you — so go ahead and acknowledge yourself. 3) What did 2018 teach you? Ahh, the lessons of the year. Easy to miss unless you take stock. Reflect on both the positive and the tougher moments in your year past. Then make a list of the key lessons learned – large and small – and reflect on how the “school of 2018” prepared you for the year ahead for career and life. 4) Where do you need to clean up your ‘messy bits’ with some forgiveness, atonement, compassion? No matter how well intentioned and successful you may be in navigating work and life with grace, we all experience occasional ‘messy bits’ in our work and life experiences. Perhaps mistakes were made; communications blunders made; relationships compromised; or an opportunity to do some good missed? With whom can you clean up those messy bits by conveying some authentic atonement, forgiveness, and perhaps some compassion? And don’t forget to forgive yourself if you’ve not met some of your own high standards and perhaps made some of your own mistakes. 5) What made this year unique in some way? Sometimes it feels like the years pass and they are all the same. But when we pay attention, something stands-out that can define a time in our life. Think about your year: What key events, situations, experiences truly defined what 2018 was all about for you? 6) Give your year a theme. 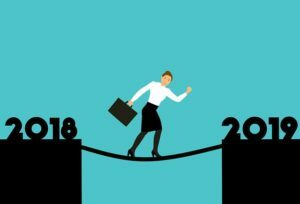 You may have started with a mantra or theme at the beginning of the year (especially if you have read last year’s questions) but things may have taken a different turn or something else feels more salient to you. Send off 2018 with a theme by completing this phrase: 2018 was the year of ___________. 7) What do you want to create in the year ahead? Notice the word ‘create’ instead of simply asking ‘what do you want’. This is more than citing wishes. This is about getting clear on intentions to create and/or transform something that matters to you in the year ahead. And, knowing you have some power and influence to achieve this. Then ask: what will you commit to in order to make this happen? What will you need to say more ‘yes’ to and what will you have to start saying more ‘no’ to? Life is full of opportunities – stretch yourself while also knowing your boundaries. And more – see the rest of the Qs below. 8) What do you need to learn in 2019 — and who will be your ‘teachers’? A year from now you will be reflecting on what you learned from 2019. Start your learning plan now and generate some personal and professional learning goals. Perhaps some new technical and professional skills to help you get to the next level in your career? How about some personal skills to ensure the best of you is showing up day-to-day with others, and with yourself? Resilience, better communications and emotional intelligence? Equally important: ask who will your teachers and guides be in your learning? Don’t go it alone. Think about who will support you in this learning: Mentors, coaches, teachers, courses, friends, etc. 9) How will you connect with your Superpowers this year? Can you readily cite what your best talents, strengths and abilities are? Are you using and growing them in your day-to-day in work and life? Might this be the year you will bring all this and your unique Superpowers into greater focus to help you step into your best game for the year ahead? 10) How will you be on top of your game with adequate rest and recovery? Your success will be based not only on how hard you work, but also on how well you rest and recover. In our drive to do more and be better, this often gets overlooked. If you want to perform at your best, take a hard look at how you schedule, plan and truly take your rest and time-outs. Beyond vacations, beyond weekends (if you take them), think about daily breaks and white space moments – for recharging, for reflection, and for rebuilding your resources. 11) How will you be there for others? Most of these reflection questions are all about you. No worries – you deserve to take some time to honour yourself. But as I wrote in a recent article — “Other People Matter” – being there for others is good for you, for others, and creates healthier workplaces, families, and communities. Making others feel valued, appreciated, and understood is one of the most powerful acts of humanity and kindness that one can show. Imperative for leadership – and really for anyone in work and life. In the busyness of work and life we often mean to do better but our to-do lists can side-track our best intentions. How will you make sure this intention stays top of the list? What stands out for you as you reflect on your intentions for the year ahead? Draw from your hopes, learning goals, or aspirations to create a personal mantra to hold on to. Complete this phrase: 2019 will be the year of ________. Wishing you a meaningful holiday season to prime you for a great start to the new year. Excellent article. Brings focus to the new year. Thank you Lynne, indeed it does. Thanks for the comment. Happy New Year! Thanks Mary! Great to hear from you.